Nationals fans have nothing to complain about right now—the team is three wins over .500 for the first time in a half-decade. Nevertheless, it's my duty as a Nationals ticket buyer and a sports blogger to bring this to the attention of the InterWeb: Tyler Clippard is stealing other pitchers' wins. Okay, maybe that's a bit of an exaggeration, but he has "earned" three wins in his last three appearances despite A) allowing all four of his inherited runners to score, B) blowing the lead each time, C) not pitching with the lead at any point thereafter. Sure, Zack Greinke's run of brilliance in the context of Royal ineptitude makes a great case against pitching Wins and Losses, but Tyler Clippard is working just as hard at the other end of the scale. Exactly how ridiculous is it that Clippard got the win in each of these last three games? On Thursday, when Scott Olsen pitched a no-no through 7.1, Clippard's Win Probability Added was 0.085; Olsen's was 0.291. On Saturday, when Matt Chico started for the first time since 2008, Clippard actually cost the team a shot at the win, notching a WPA of -0.248—the single worst WPA of any player on the team that day. On Sunday, as Livan Hernandez continued his age-defying streak of dominance, Clippard once again cost the team runs, notching a -0.038; Livan's WPA was 0.349, best of the game. To summarize, Clippard has amassed three wins despite a combined Win Probability Added of -0.201. 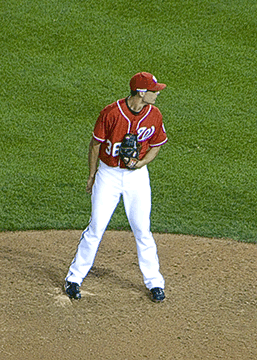 In English, Clippard reduced the team's likelihood of winning each game by about 6.7% during his three-game "winning streak." He was not the leading contributor among pitchers in a single one of these games. In fact—and this bears repeating—he "won" Saturday's game despite being the worst player on the team! So while the Royals continue to remind us why a pitcher shouldn't be punished because he plays on a bad team, Nats set-up artist Tyler Clippard continues to earn Ws he doesn't deserve.